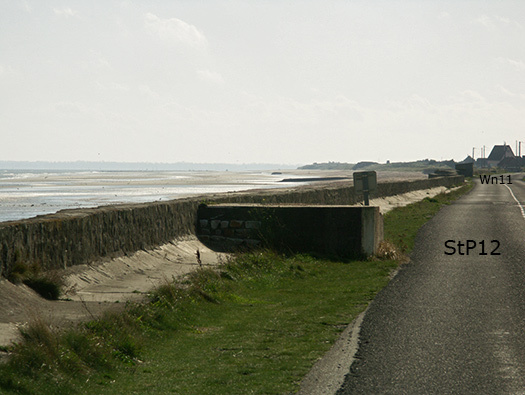 StP12 Ravenoville St-Hurbert, K.V.U.Gruppe Marcouf, K.V.Gruppe Cotentin Ost. 4./919. Grenadier Regiment, 709th ID. 1 x R612 casemate + searchlight. 4 x Pz.Drehturm Bf.67 neu Tobruk. 1 x Searchlight (Scheinwerfer) 150cm. All bunkers are actually here on site and only the R612 has had its top removed but it does show its gun room floor very well. I suppose ART not Graffiti. 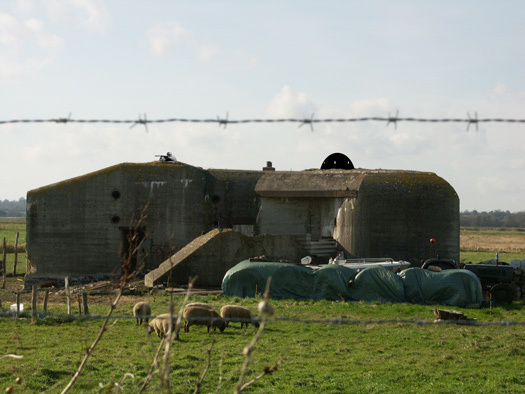 Built in 1943/4 as an extra defence between two smaller Wn´s. 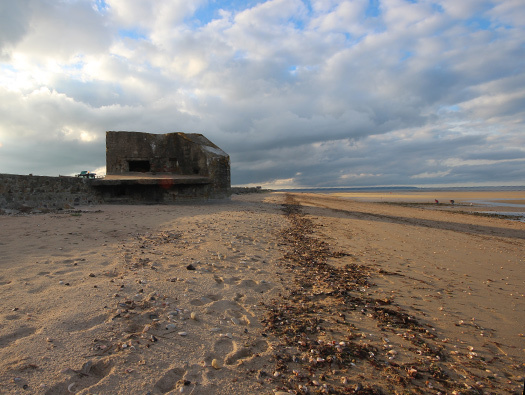 This StP was built around an R667 casemate very different from any other I have seen. 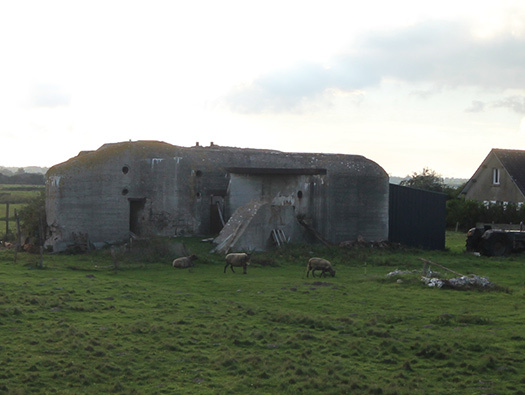 The casemate has extra embrasures for machine guns. Its rather unique. 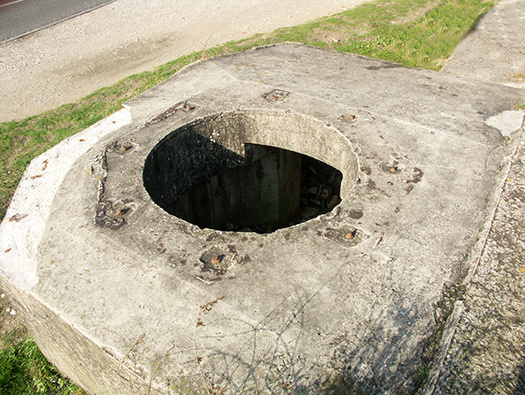 An R634 a six embrasured steel turret covering 360° around the StP. 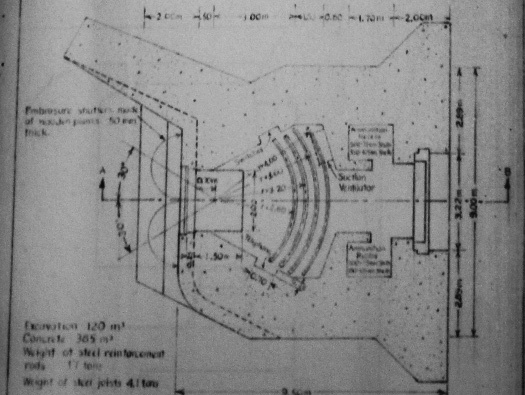 Four Bf.67 neu tank turret Tobruks also able to fire 360°. An R612 finished off the defence with a 7.5cm F.K. horse drawn gun. 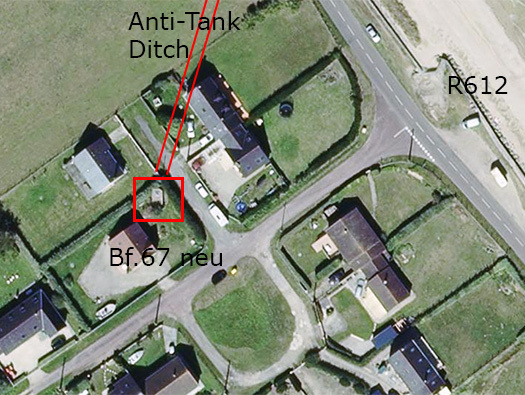 The red lines are the anti-tank ditches dug all around the rear plus two spurs running out from a Tobruk and the R634. The whole area would be wired in and a mine field added. 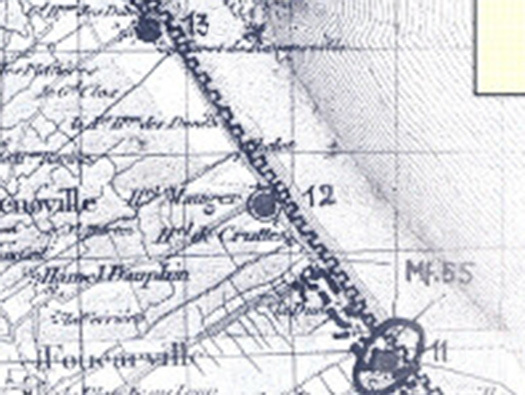 German plan of the beach defences. The map shows Wn13 & Wn11 with StP12 in the middle. 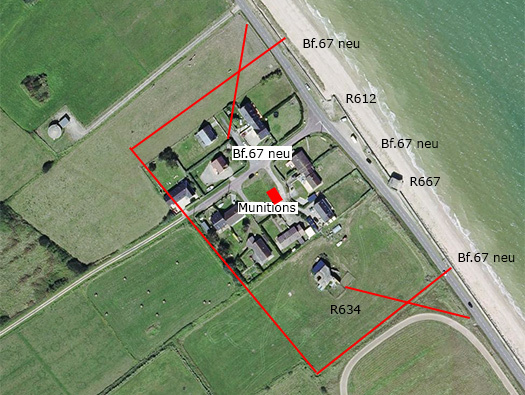 On the seaward side a mine field Mf.55 along the sea shore. 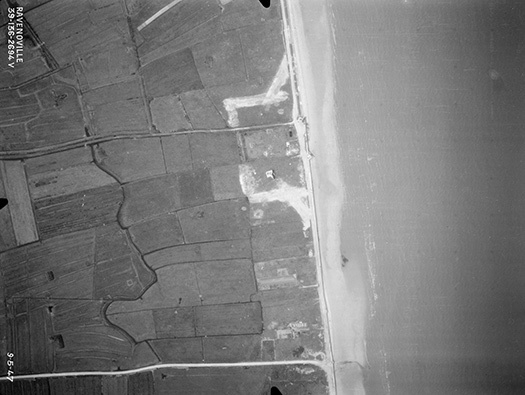 A very good air photo taken in May 1947 with all the anti-tank ditches filled in but all the bunkers look extant. 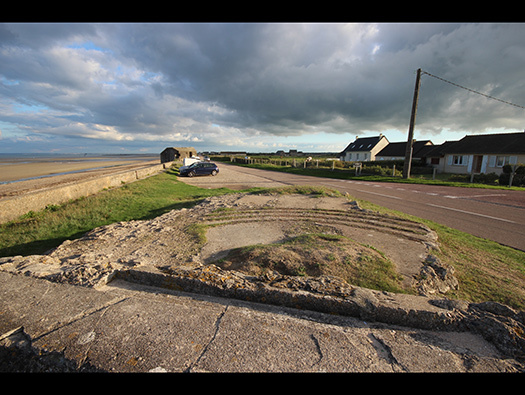 This is the first Tobruk set against a small anti-tank sea wall was an R35 turret from a captured French tank that would have been fitted on its top. There are three Tobruks of this type within the defence. APX R R35 3.7cm KwK144(f) plus an M.G.311(f). 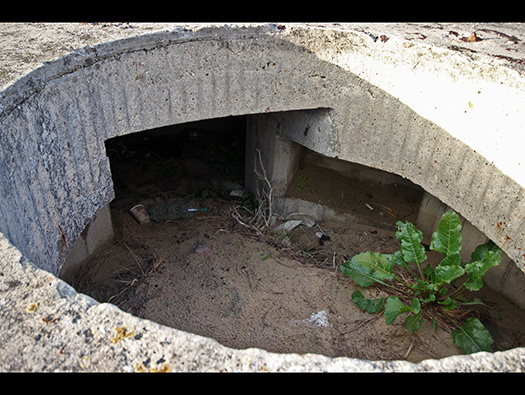 StP12 Ravenoville St-Hurbert R634 six embrasured turret bunker. 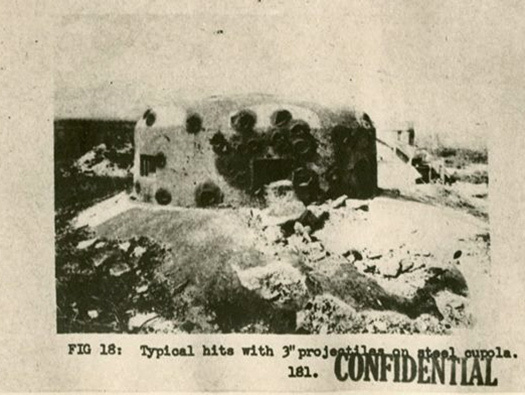 This bunker has an M.G.34 machine gun fitted into a 20P7 cupola with six embrasures. 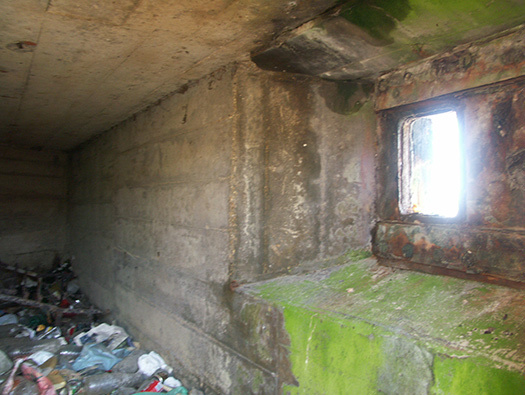 Inside the turret the M.G.34 could be moved from one embrasure to another as it is needed. A large crew room for about nine men, commander, gunner, ammunition handlers, one man in the Tobruk and another covering the rear door with the lose combat machine gun. The 20P7 dome has been removed I have added one for effect and a Tobruk gunner in his place. 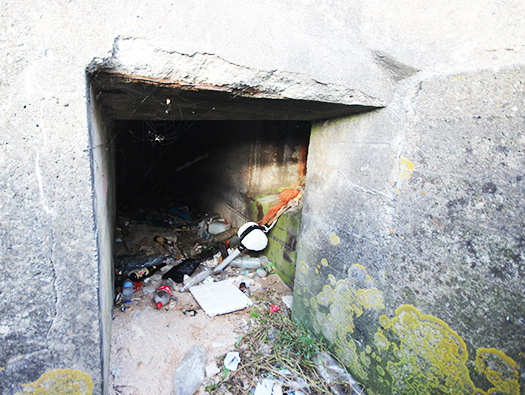 The rear entrance has an embrasure and defence room with a machine gun covering the rear door. A small wall has been added here and at the two other bunkers of this style covering the entrance so they may have found a week spot and filled it with the wall??. Ventilation room had up to three ventilation pumps, usually hand operated by turning a handle. Anti gas and smoke filters filters can be used. When the gun fires the smoke and fumes would be very high, so the ventilators would be started and fresh air from outside is sucked through the filter and pressurises the bunker, thus no fumes or gas can enter. 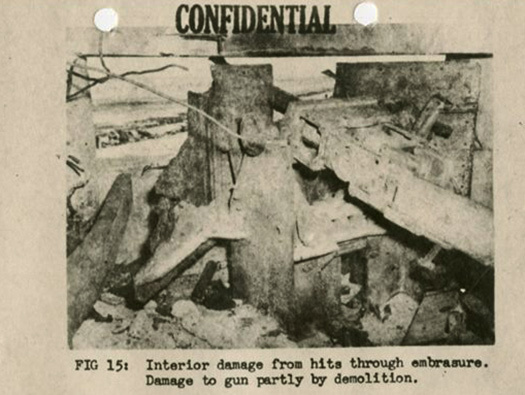 This picture shows a 20P7 dome after the battle hit many times by 3” shells, a 3” shell is a 75mm Sherman's main gun at StP16..
Embrasure ball joint for a machine gun. 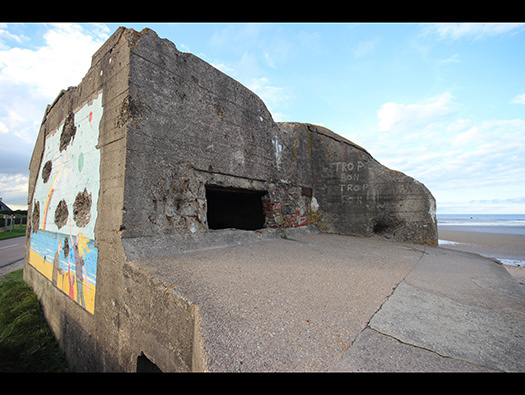 StP12 Ravenoville St-Hurbert R667 casemate. Just after capture this photo was taken also showing the battle damage. The more I look at this photo the more I believe its from the gun above. The page with the above photo is 189 and this one is 190 so, very coincidental. Except its a 5cm NOT an 8.8cm gun???. The basic R667 sits on the top of a small embrasure and machine gun room under the lip of the glasses. 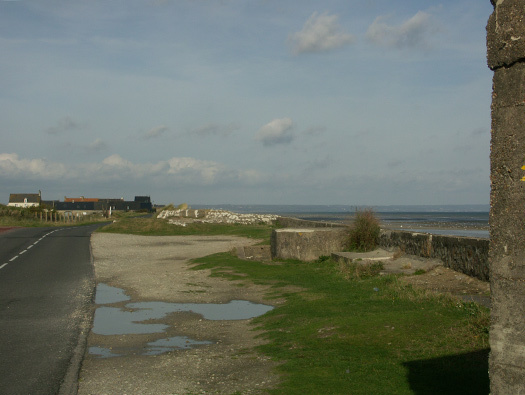 The sea wall still at the same height running along. Plenty of battle damage can be seen today. 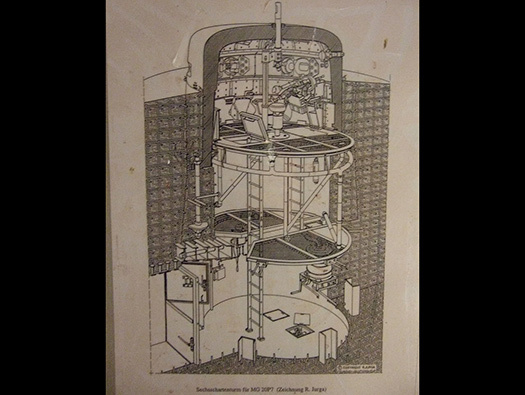 Elevation plan of this R667. 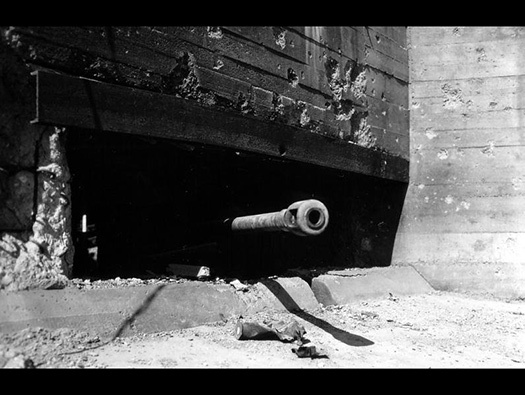 5cm KwK in the embrasure and two probably M.G.34´s in each small embrasures. 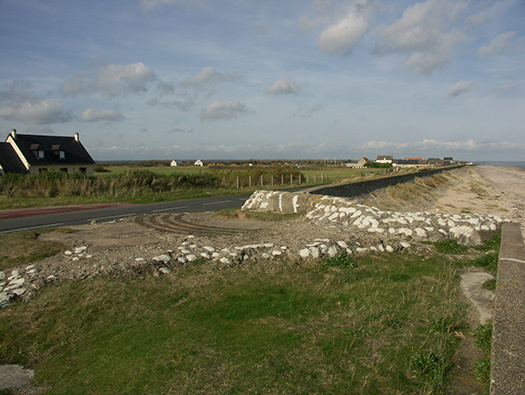 This is looking from the rear with the sea wall looking as though its cutting through the bunker and another embrasure has been built into the rear wall. 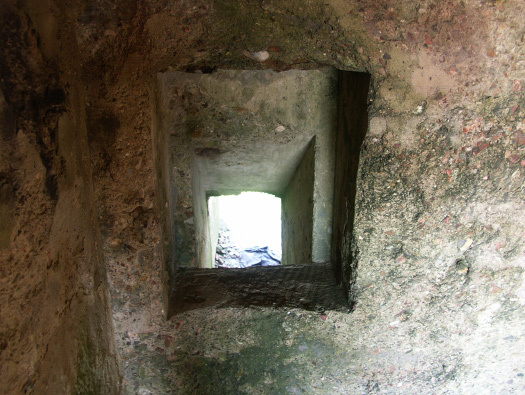 The entrance to the embrasure. also battle damage from the rear. 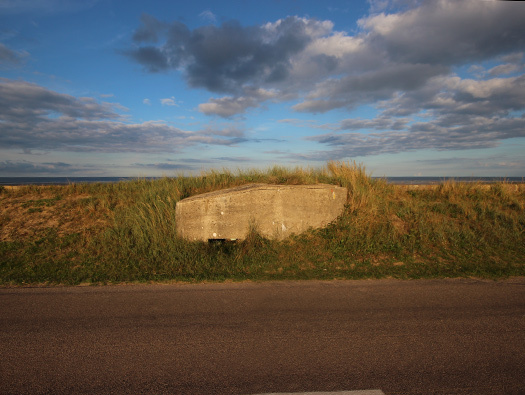 The coat of arms was cut out of the square on the back of the bunker. 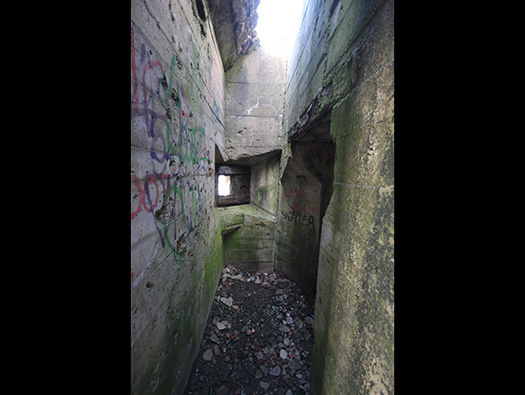 Looking in through the rear passage at the machine gun embrasure and on the right the entrance to the casemates gun room. 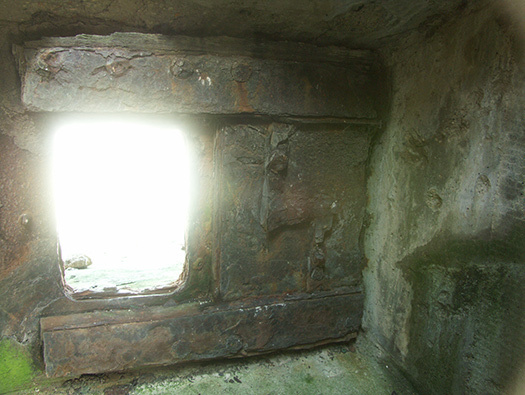 Could be a 42P01 close combat embrasure window. 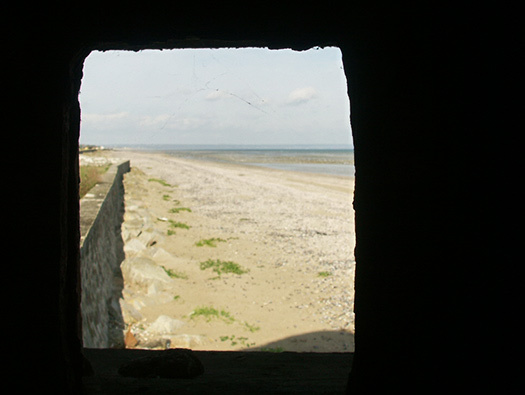 The view the gunner would have had out of the rear at the sea wall. 483P2 This is another embrasure that it could be. Gun room and you can just see where the gun was bolted down a circle on the floor which means the left hand side of the guns embrasure was concreted over so the gun did not have as much traverse to the left. 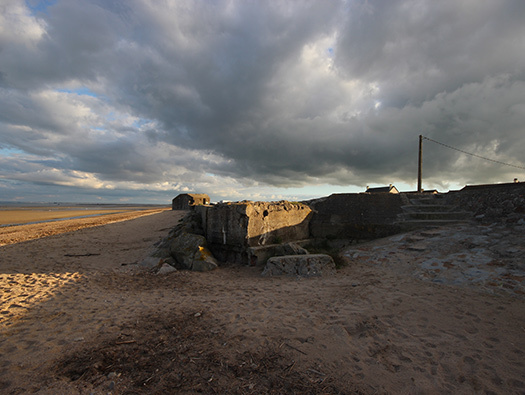 Report on German Concrete Fortifications was a coming together of all forms of intelligence about the beaches and their defence. 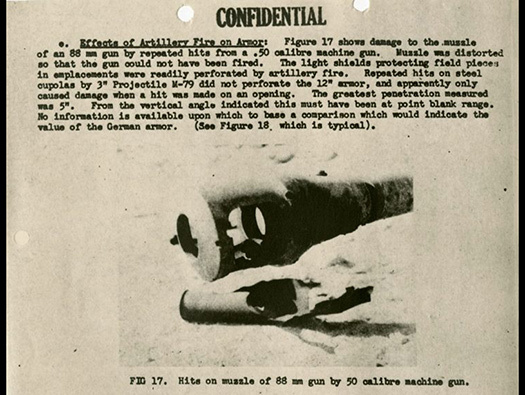 This shows an after battle picture of a 5cm KwK with its shield very badly damaged at StP16. Rear of the gun room this slot is for spent shell cases to be thrown out of the bunker down this shoot. Keeps the place clean and tidy in battle. 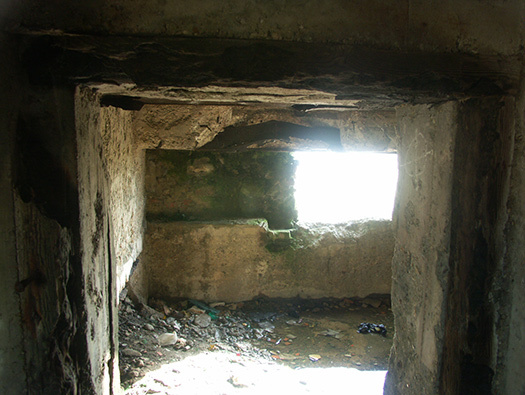 The entrance to the small combat room. 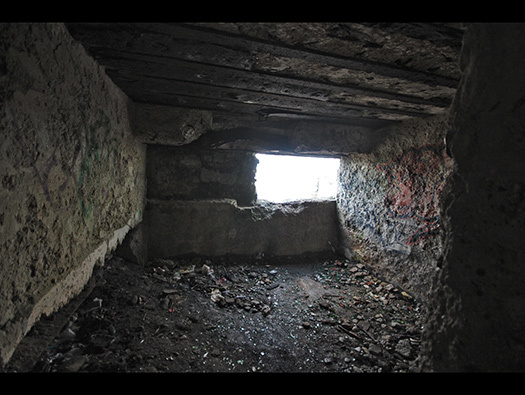 Combat room and another close combat embrasure in place. 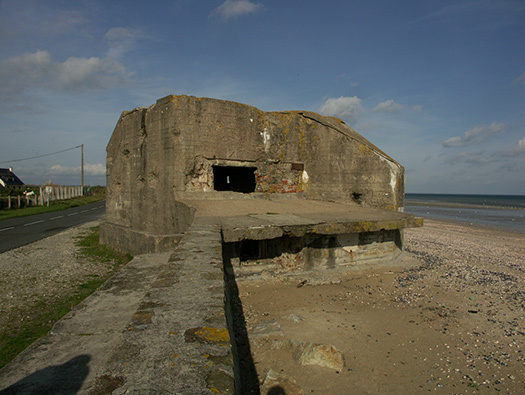 The main casemate again and you can see the embrasure has been bricked up the seward side giving the gun more cover but not allowing the gun full travers. Note the close hit on the flanking wall. 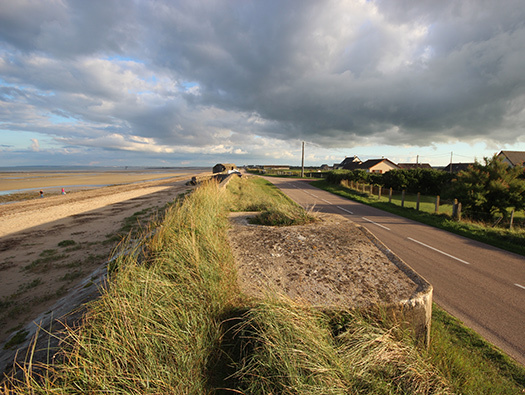 Possibly a Sherman shooting along the beach. Local soldiers assembling concrete pyramid defences. After its capture and it does look a shambles. 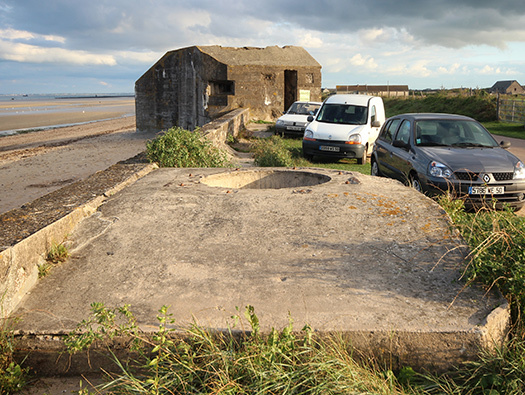 The rear of the casemate. Bf.67 neu Tobruk with an S35 turret on its top. 4.7cm KwK 173 (f). S35 turret from a post WW1 French tank. Bf.67 neu Tobruk with a turret ring bolted to it open ringstand. a gunner stands (or sits) in the turret and a second man helps with ammunition. 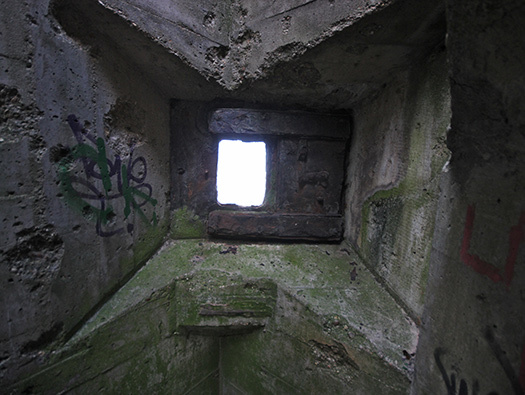 Inside the rear of a turret. S35 4.7cm KwK 173 (f). 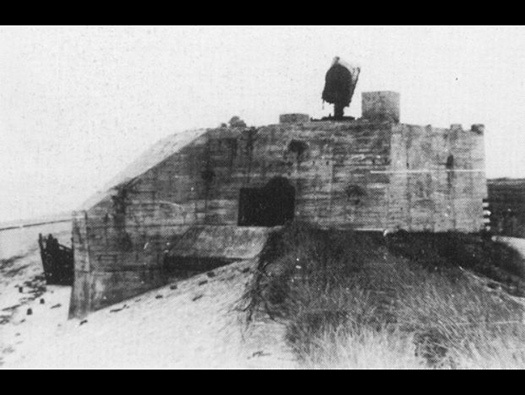 Bf.67 neu Tobruk the turret ring bolted down on the eight bolts still standing..
APX 1 CE S35 Turret. 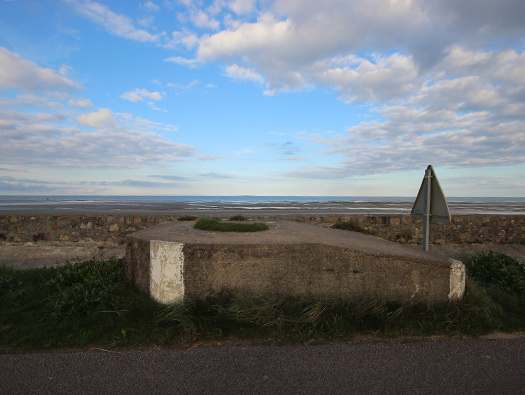 Looking into the ringstand showing ammunition niche and the entrance back into the Tobruk. 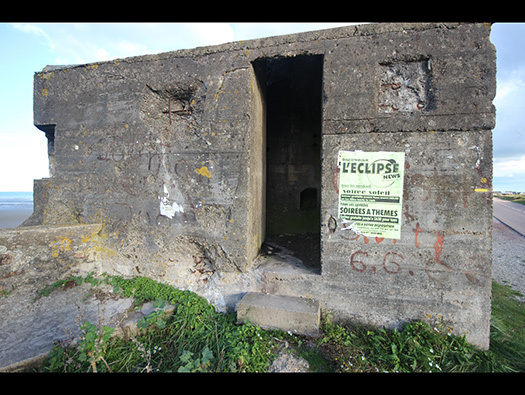 StP12 Ravenoville St-Hurbert R612 casemate. 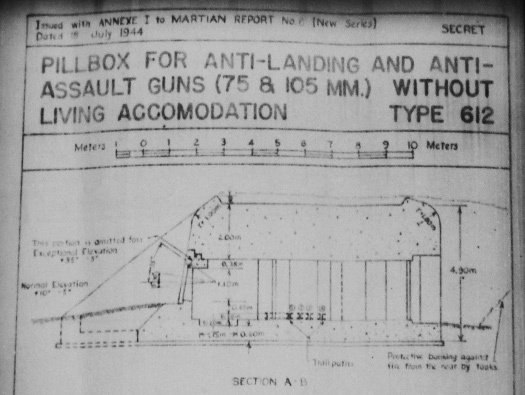 An R612 casemate for an assault gun (anti landing gun). The gun was an old horse drawn Field Kannon 7.5cm probably from WW1. 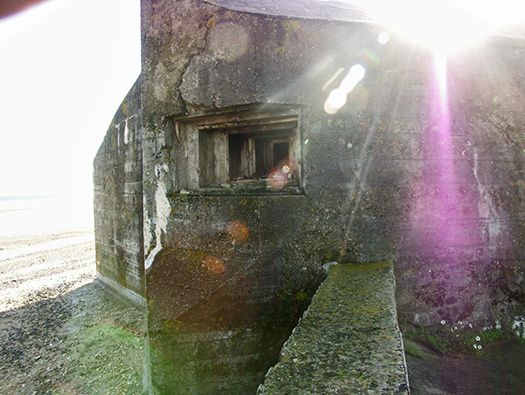 The casemate and the end of the battle showing the 150cm searchlight on its roof. A cable ran back into the StP and to a small generator bunker/shed. The light would have been used to light up targets at sea at night. 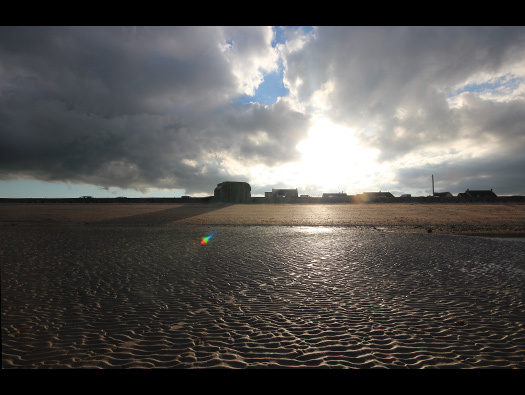 Rommel had ordered more searchlights. 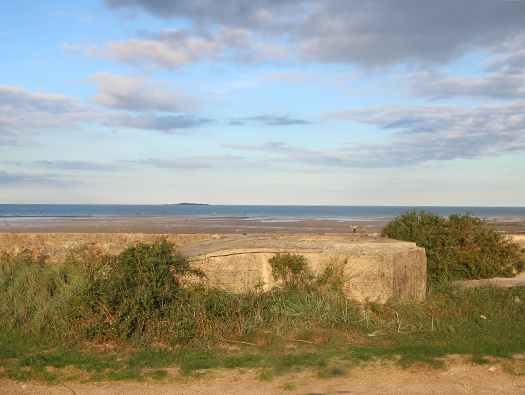 Just the foot print of the casemate left. 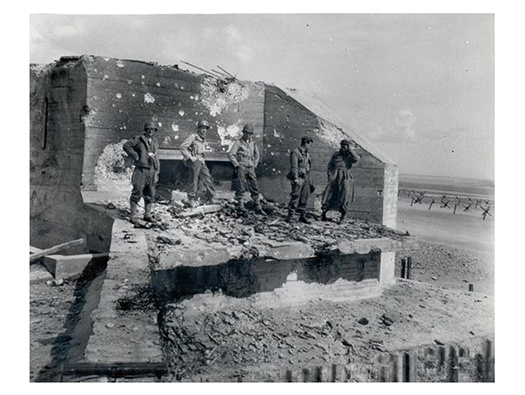 Allied report on the casemate. 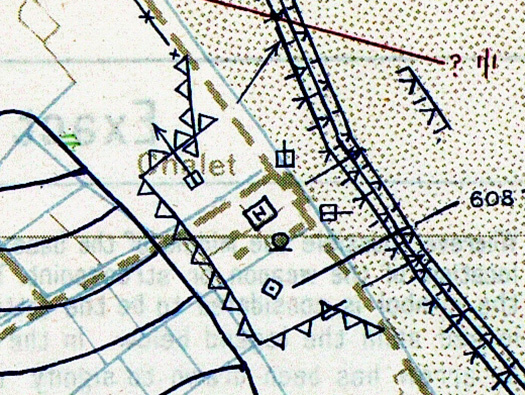 The plan shows two niches for ammunition, usually case and shot. The half round arcs are for the guns trails to sit in to stop the gun from going backwards when fired. The third Tobruk in the group. This one had an APX R R35/H35 turret with a 3.7cm KwK 144(f) main gun and an M.G. Tobruk No.4 this one also had an APX R R35/H35 turret with a 3.7cm KwK 144(f) main gun and an M.G. This is how a Bf.67 neu looked. 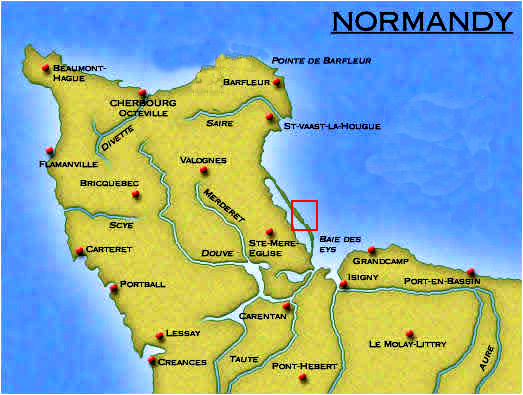 This is the relevant part of a Bigot map dated 12 May 1944 a moth before D-Day showing the known (known to the Allies that is) defences. 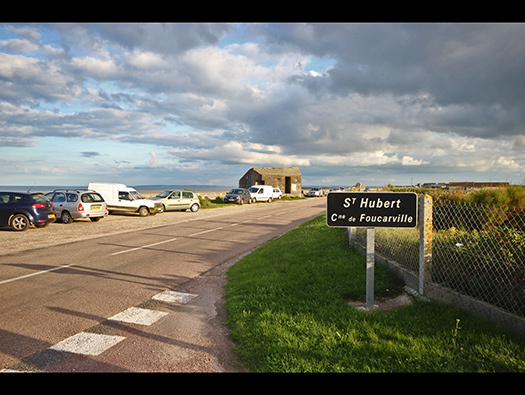 The plan states that a 608? under construction in May 44. They were wrong it is a 634. 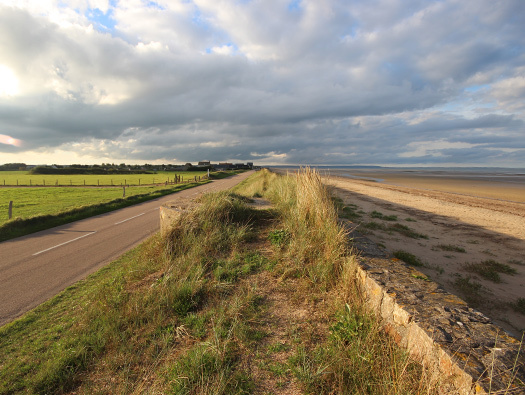 On the evening of June 6, Lieutenant Meidam (the 4th Company of the First Battalion of the 919th GR) moves his men into Wn10 defence site. Then Wn10a and Wn11 and finally to StP12. With the survivors of the garrisons of the Wn10, Wn10a, Wn11 and StP12, StP12 holds out for several days. 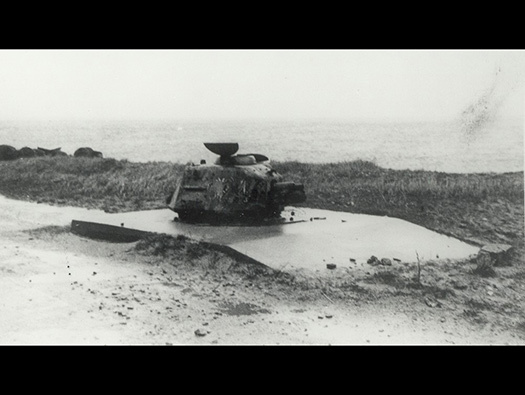 The anti-tank gun and the anti-landing field Kannon in StP12 are destroyed after June 7, and there is only one twin machine gun in the armoured cupola (the 6 embrasures of the R644 bunker at the back of the StP). 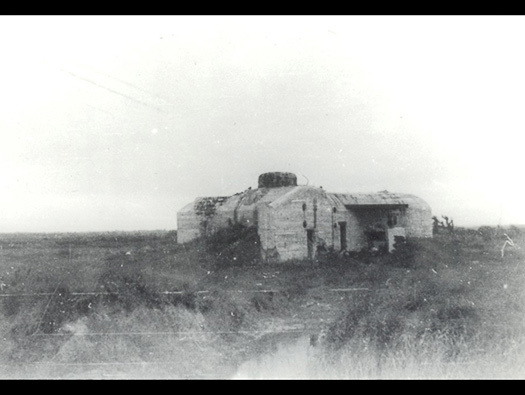 Lt Meidam went (left unspecified date) when surrounded by numerous tanks and it has become impossible to leave the bunker in the dome but also because there is no more food and half of Germans are wounded and no ways to treat them. The testimony of Lt. Meidam was collected by Lt. Col. Keil as prisoners when they were in the same camp. EF.